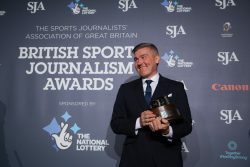 The 2017 Canon sports photographer of the year, Richard Pelham of The Sun, has again been named in the shortlist for sports picture at the British Sports Journalism awards. Pelham is not the only returning winner. Clive Mason, who took top prize in the Canon sports portfolio category a year ago, is shortlisted again and also in the specialist portfolio category. Getty Images colleague Michael Steele is shortlisted in four of the five categories. Partners Canon are sponsoring two categories as well as the exhibition which showcases the amazing images produced by the nation’s best photographers. All the shortlisted entries will be on display. The Ed Lacey Trophy for Canon sports photographer of the year is awarded to the overall best sports photographer of 2018 who has demonstrated an outstanding range of photographic skills. This will be judged on submitted entries into the categories listed below. All other awards are subject to entered submissions which are then put before our panel of judges.